Your mattress should be built for comfort, but your bed should speak to your tastes and set the tone of your room. Whether you opt for a modern, subtle platform frame or a traditional sleigh bed, your selection should satisfy both in terms of form and function. Before you buy, consider your ideal sleeping scenario. Do you want to be low to the ground, elevated up high, or enveloped in a canopy? Once you’ve decided what’s most important to you in a bed, find a style that fits your budget and feels cohesive with the rest of your bedroom furniture. Your bed is the foundation of a well-designed bedroom, but such an expensive purchase can feel daunting. That’s why we’ve rounded up our favorite bedroom furniture retailers so you can spend less time shopping and more time sleeping. Since West Elm opened its doors in 2002, it’s been a go-to home goods store for modern, on-trend styles that won’t break the bank. If you’re hunting for a statement bed that will set the tone for the rest of your bedroom’s design, West Elm is the place to go. You can shop at one of its over 100 brick-and-mortar locations, or buy online and have your furniture hand-delivered and assembled. 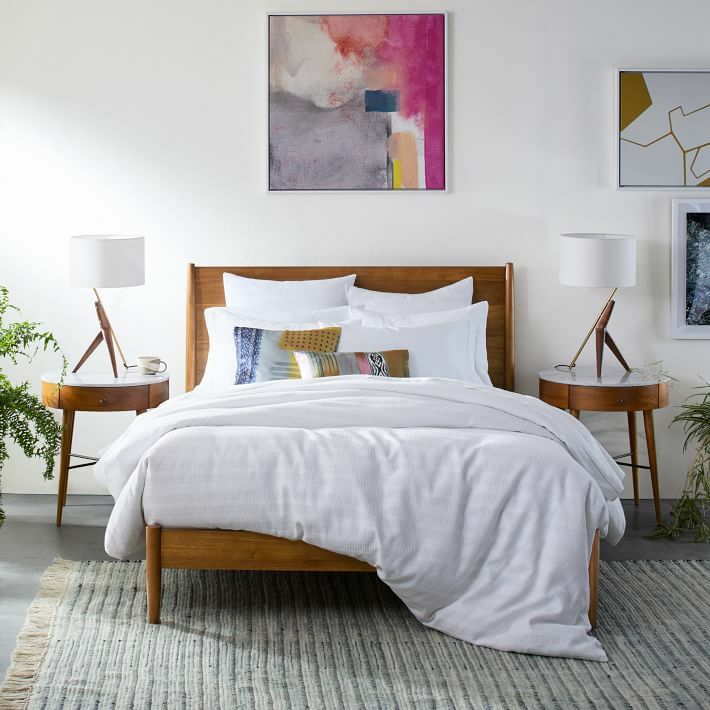 West Elm is one of the best places to shop mid-century modern and contemporary pieces, with most of its line averaging around $1,000 for a queen bed. You can shop by length, width, and finish, and you’ll find over 20 in-season options on a given day. As a bonus, West Elm is also a certified retailer of the popular Leesa mattress. They also carry a wide selection of trendy sheets and duvet options so you can outfit your bed from headboard to footboard. Wayfair is a mainstay when it comes to affordable home decor. It has an unbeatable selection of beds and frames at every price point. Starting at just $50 for a simple, adjustable bed frame, Wayfair’s selection features a variety of affordable but stylish options that work in any room. With over 6,000 options to pick from, we’re sure you’ll find a bed to outfit every room in your home, from a nursery to your master bedroom. Some of its most popular items have a modern aesthetic reminiscent of what you’d find at higher-end stores, but at a lower price. Wayfair reviewers help take the fear out of purchasing a bed online. Plus, most in-stock items include free one-day shipping. CB2 is Crate and Barrel’s modern-leaning sister, a home goods store with a chic, updated flair. If you covet a contemporary bedroom look, CB2 should be your first stop. Its selection starts at $500 and ranges from simple matte metal to acacia wood and leather. Most of its collection comes in queen and king sizes, but it does offer some full-size options as well. You can opt to either have your bed delivered or you can pick it up at a nearby warehouse to save on shipping costs. We love how unique and special every CB2 bed feels, with designs you won’t find anywhere else. Plus, if you’re wary about buying online, you can see most options in-store at one of CB2’s brick-and-mortar locations. Walmart is a great low-cost retailer for every room in your house, including the bedroom. Its website offers over 5,000 bed options, some of which you can even pick up in-store. From simple platform beds by Walmart’s in-house label, Mainstays, to pricier upholstered headboards from well-known brands, there are endless options to choose from. It offers sizes ranging from cribs to twin to king, and some of its best-selling styles cost less than $200. Whether you’re surprised to find such a broad selection at Walmart or you’re a diehard shopper, we guarantee you won’t regret giving this prominent retailer a chance if you’re in the market for a new bed. With more than 8,000 beds to choose from, Amazon has one of the largest selections you can find online. Starting at just $50, you can find everything from an adjustable metal bed frame to a replicated mid-century modern wood and metal bed that looks much more expensive than it is. Plus, most beds are eligible for Prime, so you can save money on shipping and delivery costs—something not all online retailers offer. Because most styles are build-it-yourself, AmazonHome Services offers expert assembly for an added fee. This means you don’t have to struggle over hard-to-understand directions. When you’re in the market for an expensive piece of furniture, it can be scary to buy online, but Amazon’s review network is unparalleled, offering an entirely stress-free online buying experience. As one of America’s favorite department stores, Macy’s is a great place to outfit your entire bedroom, from the rug to the bed itself. It has more than 1,500 beds to pick from, with most of its stock ranging from $400 to $700. If you’re a Macy’s cardholder you can save big on large purchases—but even if you’re not, this famous retailer often offers coupons to give you a little discount. Macy’s offers a large selection of contemporary styles like tufted fabric headboards as well as traditional wooden sleigh beds. If you buy a bed from Macy’s online, you can opt for quick UPS shipping or have it scheduled for delivery on a specific day. Since it was founded in 2011, Joss & Main has quickly become a popular destination for all things home. A sister to Wayfair, this popular online retailer positions itself as a source of chic, on-trend styles for less. It also offers a more curated selection than some of its competitors. Its bed selections start at just under $100 for a simple platform frame, with some of its popular styles ranging from $100 to $300 dollars. Many of Joss & Main’s styles fall under the modern farmhouse umbrella, with upholstered panel beds, rustic wood headboards, and tufted sleigh bed options. Joss & Main offers free shipping on all orders over $50, and some items can even arrive in just two days.